A hugely successful event drawing an estimated 20,000 people promoting racial harmony this past weekend that was put on by talk show host and The Blaze creator Glenn Beck has been met with stony silence by the mainstream media. The event, Restoring Unity, happened in Birmingham, Alabama. The media blackout is especially noticeable given the months of coverage given to the radical Black Lives Matter movement. Beck’s weekend-long Restoring Unity rally was held in conjunction with Birmingham area black mega-church Guiding Light Church, and included “worship music, prayer and powerful testimony.” It comes at a moment when media coverage and awareness of relations between black and white Americans is at an all-time high, driven by Black Lives Matter activism, a non-stop barrage of news reports, and the White House bully pulpit. The radio silence on the event certainly isn’t due to a lack of turnout: a conservative estimate of the crowd size was 20,000 people, and those numbers come from police and reporting at AL.COM, not from Beck’s organization. Breitbart Texas spoke to a reporter who has covered civil rights marches in Birmingham for around thirty years and was told that Beck’s event was the largest turnout he’d ever seen and believed it was the largest turnout since the Rev. Martin Luther King’s march in 1963. Nor can the lack of mainstream media be attributed to a lack of star power. A number of high-profile conservative personalities appeared at the event, including acclaimed actor Jon Voight and GOP Presidential hopeful Sen. Ted Cruz’s father Raphael Cruz. Actor Chuck Norris, a conservative activist known for his martial arts, action movies and TV show “Walker, Texas Ranger,” marched about two rows behind Beck. 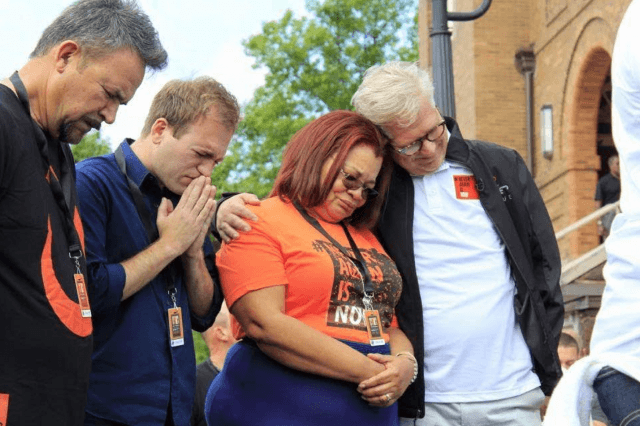 Alveda King, a niece of civil rights activist the Rev. Martin Luther King Jr., marched in the front row. Bishop Jim Lowe, pastor of the predominantly black Guiding Light Church in Birmingham, co-organized the march with Beck and marched with him at the front. As a child, Lowe attended Sixteenth Street Baptist Church, where the march started, a headquarters church for the civil rights movement in Birmingham. Lowe and his sisters were in the church when a KKK bomb blew up the church and killed four little girls on Sept. 15, 1963. Breitbart Texas spoke exclusively to Aveda King, who said from her position at the front of the march that the crowd seemed to “go on and on, around every block.” King — who sang the song Pray For America — was also onstage with a gospel choir when Jon Voight lept to the front and joined the black choir group in song. King said that the racial mix of the crowd was an estimated 90% white and 10% black during the march, but was more balanced during some of the Restoring Unity events. She also said that the black members of the audience responded to Beck’s speeches and gave him several standing ovations, all facts that stand in sharp refutation of the narrative that white and black Americans are unwilling to have a real dialogue on race issues. Despite the liberal media rhetoric, however, King said that, as far as the MSM goes, “the event never happened.” In theory, the message of love and unity promoted at the event should also be something that the mainstream media should have eaten up. It’s impossible to imagine that the media would not have gone all-in on reporting a Black Lives Matter event of even half the size and with half the well-known names. Instead, the media has spent months promoting false stories about the Trayvon Martin and Mike Brown shootings and readily given an amplified microphone to Black Lives Matter to promote their anti-police, anti-white message. In recent days, the chickens have come home to roost on the media narrative with the shocking on-air murder of two reporters in Virginia and the execution-style killing of a deputy sheriff in Texas.